Happy happy birthday, Erica Jean! Please find below a link to the documentary short by Naomi Ture, Chris Faber, Nick Davila and others that have contributed to its creation. Thanks to the support of friends, family and donors, we are making finishing touches to A Perfect Donor. 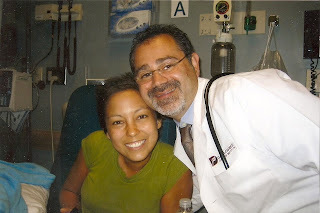 This 6-minute piece aims to encourage minority viewers to donate their bone marrow stem cells through a connection with a passionate and driven young woman living with leukemia. The short is intended for distribution online and through bone marrow drives and educational events. We're fundraising for the feature documentary, Laughter in the Wind, which will bring more intimacy to the issue, affording the audience the time and space to experience, reflect on and absorb the deeper existential issues and transformative power of Erica's journey. With a broader audience, we hope to compel viewers to take action. I find it hard to believe that it has almost been nine months since Erica was alive... As time goes, I miss her face and voice so much. I thought it might be nice to share a few pics I came across while backing up my computer... Videos of us together and pictures of her laughing seem to help me when I'm feeling low and get me through a little bit longer... I hope the following photos make you smile too. Today is Erica's 30th birthday, a milestone that she should have reached and had the pleasure to celebrate with her loved ones. And for those of us who did have the pleasure to know her well, can you even imagine how big and festive this party would have been?? Certainly there would be dancing, laughter, drinks and lots of food from around the world! I can hear her voice saying, "the more the merrier" (as she frequently did!) and I think she would have wanted every friend she ever had to know they were welcome at her party. It's funny because I have been so hesitant to blog. I remember her nagging at me over and over again to blog for her because she was too tired to write and she didn't like huge gaps of time between postings... But now, it doesn't feel appropriate to speak for her on this site that has evolved into her amazing journey and the place that allowed her a chance to process her thoughts and feelings. I don't want to make assumptions about what she would have done had she lived, who she would have become, what paths she would've chose... Nor should anyone try. She was full of surprises and my favorite were her birthday surprises!! When I was 14 years old, Erica threw a surprise dance party in our garage for me (still my favorite birthday memory!) to each year as adults doing something together and new, I always looked forward to celebrating the marking of another year with her. So this year, on her birthday, I am proud to announce that Erica Jean Murray has earned her Master of Arts from Tufts University!!! I always bragged that my sister was a smarty pants, but to earn her Masters while undergoing chemotherapy, radiation, steroids, and a bone marrow transplantation--she's a rock star! Once again, Erica continues to touch lives even after she's gone. Below is the email from Dean Sheehan of Fletcher School at Tufts University where they, too, will be hosting a service to remember Erica. Please note the highlighted paragraph: I am so proud of the Fletcher community for not only remembering Erica, but for continuing her message of awareness and hope for anyone in need of a bone marrow donor. Last night, Andres and I had the honor to attend the Black Tie & Black Jack fundraiser for the Leukemia and Lymphoma Society NYC. It was inspiring that over 600 people were there showing their support to find a cure for blood cancers, even in this current economic slump. There were tables with black jack and roulette, drinks and hors d'oeuvres, and all proceeds went to the Leukemia and Lymphoma Society. A group of dancers known as the Cancer Dancers (http://www.hopeandheroes.org/CancerDancers/) performed to a cheering crowd. The night was amazing. This is a picture of Gayle Silverman (beautiful in blue along with her family), Andres' patient, who organized the whole event last night. She was diagnosed with AML at 21-years-old and begged him during her induction phase to let her go home and die. He refused to let her give up. Last night at the party, she gave a speech and specifically thanked Andres for saving her. The spotlight found him and everyone cheered. It was amazing and I was beaming with pride! Erica is so present in every day of my life, my mom's life, her friends' lives... While I can only speak for myself and admit that I struggle frequently with sadness at her absence, I can also say that I feel her strength propelling me forward. 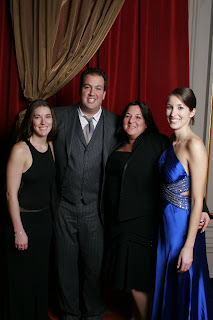 Thanks for still keeping up on this blog with its occasional postings. It seems silly to continue to write, but Erica continues to motivate and inspire--what can I do?? Erica Murray, Fletcher MALD candidate, held a special place in the hearts of many at Fletcher. Her death in early December deeply impacted those who knew her and the many who knew her only through her blog, her Follies video, through discussions with those who did know her, or through other indirect contacts. Her vitality and optimism in the face of daunting health challenges moved us all. We will hold a Celebration of Life for Erica Murray on Friday, April 17th at 3:30pm in ASEAN Auditorium with a reception following in the Hall of Flags. The Celebration will include music by the Ambassachords, readings and reflections by a few of Erica’s friends, and a few words from Erica’s sister, Jaci. Erica was someone who thrived in the diversity and vibrancy of Fletcher and was committed to building community and understanding, and all members of the Fletcher community are welcome, indeed encouraged to attend, whether you knew Erica personally or not. While a few of Erica’s friends will speak at the Celebration, we know that many of you have memories of Erica, amusing anecdotes, telling insights, or a simply a fond remembrance. We would like to collect these memories to present to Jaci at the Celebration and we will try to select a representative sample to read at the Celebration. If you have an Erica memory or an Erica story that you would like to share with her family, please send it to Sarah Strong (sarah.strong@tufts.edu). We also intend to project a photo slideshow at the beginning of the Celebration. Many of you have photos of Erica. Kindly send them to Sarah Strong as well. Finally, students have expressed an interest in institutionalizing Erica’s memory at Fletcher. After consulting with Erica’s family, we have decided to hold an annual Erica Murray Bone Marrow Drive at the School. Christina Sass has kindly volunteered to organize the drive this year. She is still working out the details with the National Marrow Donor Program and we will be in contact with you shortly regarding the details. Do send us your photos of Erica and your anecdotes and memories. Thank you. Also, please also feel free to pass this invitation along to Fletcher alumni and others who may wish to attend. WE MISS YOU, ERICA. 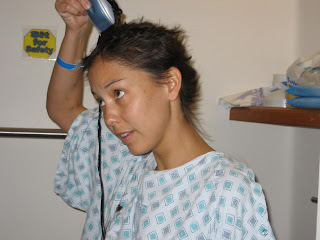 This is a site I put up when my sister was first diagnosed with leukemia, in early February 06. 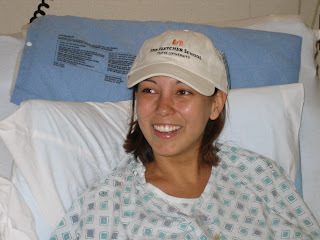 She was recovering from a bone marrow transplant of April 29, 2008, a consequence of relapsing in January in Boston this year. Six-months post transplant, leukemia had struck again. She fought so hard for so long. We miss her every day... These are her experiences, in her words, during her journey. Be A Bone Marrow Donor- Please. Pretty please. With a cherry on top? Join online. It’s easy. Have a kit sent to your home. Join in person. You can join at a drive near you. If you're already on the registry, make sure they have your updated contact info. This is just as important as getting tested! CLICK: "If I Had a Real Good Donor"